Brothers from Braddock, North Dakota: David Barth and Charles Barth. Photo taken in 1943. Charles transcribed these final words, “Would you… tell mom… and dad…” in the context in which he heard them, and then he attached them to the killed soldier. Days and weeks went by, and one of Charles’s commanding officers eventually tracked him down. His officer asked if he was the medic who wrote the note about the soldier who was hit and killed. Charles said that was the only identification he could make out since the dog tags were so shot up. The officer said they had the killed soldier’s home address, and they gave it to Charles. Eventually Charles drafted a letter to the soldier’s parents who lived in Wisconsin. He told them he cared for their son just before he was killed in action, and he wanted to pass along his final words. 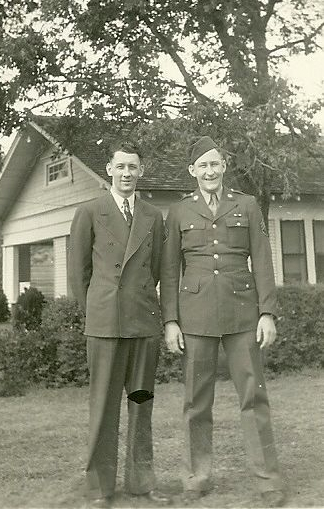 This induced a correspondence between this soldier’s parents and Charles, and they sent letters and Christmas cards back and forth until they just stopped one day. Charles suspected that the soldier’s parents had passed away, and he never was able to track them down. Nonetheless, these North Dakotan oral histories are a part of the larger picture that is the national Veteran’s History Project. It seemed more than worthwhile to share this bit of digitized history. War is ugly. It is horrible; in fact the most horrific. Yet embedded within this horror are singular stories of selflessness, empathy, appreciation and compassion. These individual stories humanize those larger historical narratives that can seem so rote and distant. The individual stories are all around, just so long as we are ready to sit down and listen. This entry was posted on Monday, July 30th, 2012 at 8:19 pm	and posted in Uncategorized. You can follow any responses to this entry through the RSS 2.0 feed. I never knew any of this from Uncle Charles. Good job Aaron on the interview with Uncle Charles.